Red Rocks Penstemon This perennial is a ‘Plant Select’ plant. Red Rocks Penstemon is a smaller growing selection of Penstemon. Penstemon is also known as Beardstongue. The foliage is medium green which bears spikes of trumpet shaped pink-red flowers with a white throat in midsummer. It will grow from 12"' to 15" tall and 10" to 12" wide. Plant in full sun in well drained soil. 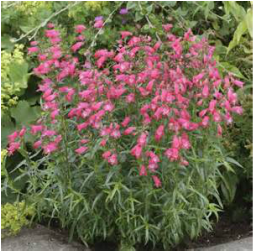 Plant Red Rocks Penstemon in a Cottage Garden or Rock Garden. It will attract butterflies, hummingbirds, and bees. It makes an excellent cut flower and will grow well in containers. Red Rocks Penstemon will become drought tolerant once established and is deer resistant. It is also a Firewise Plant. Red Rocks Penstemon is a 1999 Plant Select®. Red Rocks Penstemon was developed by Bruce Meters. Red Rocks Penstemon is named after the famous amphitheatre which was carved out of the red sandstone cliffs in the foothills west of Denver.